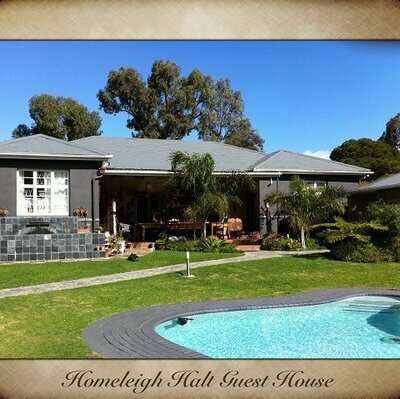 50 College Drive B& B is a beautiful Cape Dutch Style house which has been lovingly renovated and restored, by owner Jonny Kable. This is truly a home away from home to suit the traveler who prefers a cosy homely atmosphere to an impersonal hotel, the corporate who wants to come home to relax after a long day at work, out of town hospital visitors, school sporting events supporters and many more. We are centrally situated in the upmarket suburb of Mill Park, opposite the well-known and prestigious Grey Schools. We are within 5 km of Greenacres Hospital, St Georges Hospital and Provincial Hospital, Greenacres and The Bridge Shopping Mall. Also close by are the P.E. Golf Club, P.E. Bowling Club and St Georges Park. The Nelson Mandela Bay Stadium is 5 minutes away down Mount Road and the beach front and airport are a mere 10 minute (slow!) drive away. Our Deluxe room has a King size bed, 54cm flat screen T.V. 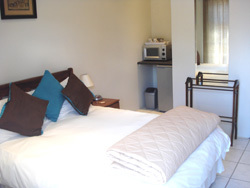 with DSTV channels, fridge, tea and coffee making facilities, heater, clock radio and hair-dryer. T he en-suite bathroom is state of the art, with large frameless shower and ball and claw Victorian bath. The Superior room has a Queen Size bed, 54cm flat screen T.V. 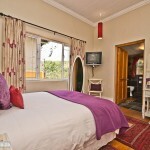 with DSTV channels, fridge, tea and coffee-making facilities, heater, clock radio and hair-dryer. 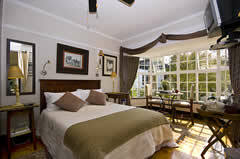 T he en-suite bathroom is also state of the art, with large frameless shower and ball and claw Victorian bath. The Standard room consists of 2 single beds, T.V. with DSTV channels, tea and coffee-making facilities. En-suite bathroom has shower only. 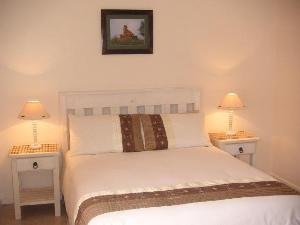 All the bedding is high quality Percale linen and fluffy white towels are provided. This is a self contained 2 bedroom flat on the premises with easy access to the pool and barbeque area. The bathroom (shower, no bath) is en-suite from the main bedroom. Amenities include a flat screen TV, open plan kitchen, lounge area and own entrance. Our garden flat is an ideal choice for a family. It comfortably sleeps 4 – 5 in the two bedrooms which are separated by a fully equipped open-plan kitchen area. A spacious shower and toilet lead off of the main bedroom. The flat is either fully self catering or B&B. Barbeque, swimming pool and deck area. Lounge area with ADSL and Fax facilities. Open plan yellowwood kitchen and dining area. Breakfasts to suit your taste, whether it be Full English or just Coffee and Rusks, served in your room, on the deck, or in the dining room. Park under antique street lamps on cobblestone paving, set among our semi-circular rose-garden and rockery. The guest lounge is cosy and private and has a small “business nook” with ADSL and Fax facilities, or sit by the log fire on cold winter nights. 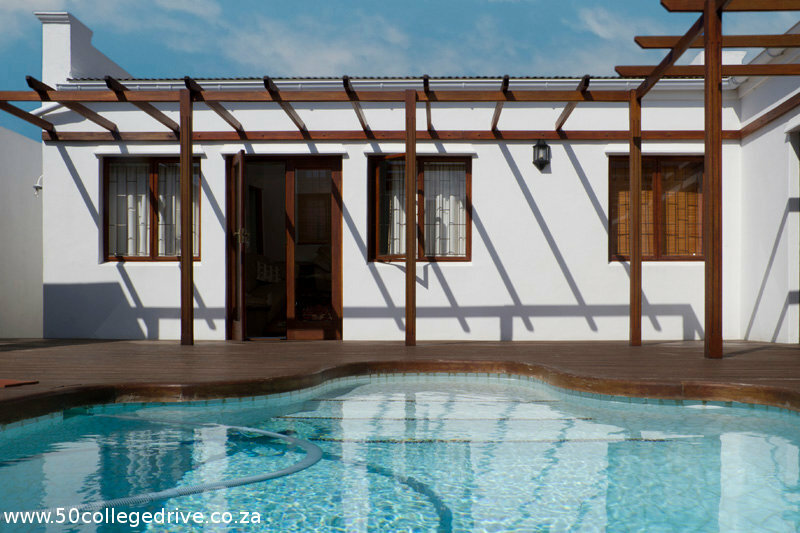 Enjoy a full English breakfast in the open-plan yellowwood kitchen/dining area which opens onto a wooden pool deck and braai area.